First Lines: Mama says an angel is coming, coming clear up the mountain, riding clear up Lonesome Creek, a tiny babe tucked in her saddlebag, a tiny babe tucked safe and warm. Synopsis: Through the eyes of a young girl we are caught up in the preparing for a new baby in the 1920’s. A small Kentucky community rallies round waiting for the arrival, celebrating and preparing for the special event. 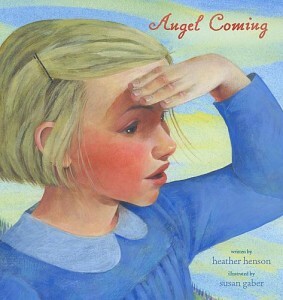 Heather shares a beautiful story of anticipation and preparation of a special event with rhythmic text accompanied by Susan’s soft painted illustrations. A historical fiction both Heather and Susan depicting the era well. What I liked: I love how the text reads with a kind of swagger, an outback feel. I loved one special illustration near the end, of the father leaning on the bed tickling the baby’s foot as both baby and mother are resting. Very cute! This would be a great story read aloud to kids, especially if there is a new baby brother or sister on the way. This story was written in relation to a saying, when in the Appalachian mountains of Kentucky, if a child asked where babies came from, the unique reply was always – babies are brought up the steep paths , tucked in saddlebags, carried by an angel on horseback. Which is no more true than – carried by stork or found in a cabbage patch. Resources/Findings: There is an Author’s Note in the back along with original photos supplied by the Frontier Nursing Service who worked during that time. This entry was posted in 12x12, Picture Book Review and tagged Children's Picture book, Heather Henson, Perfect Picture Book - Friday, Susanna Leonard Hill. Bookmark the permalink. This book looks lovely, Diane! I love the sound of the text you quoted, and this unique explanation for where babies come from! What a great addition to our list! Thank you, Clar. It’s a gorgeous book and like you I love historical fiction. Enjoy! That COVER! I put this on hold before I read the review! LOL.. I see! I don’t blame you, it is gorgeous. Enjoy, Julie! Yes, I love that cover. Although Kentucky is just south of me, I had never heard that saying about babies coming up the path in a saddlebag. Lovely folk tale. Thank you, Pat. I had never heard of that saying. Very unusual. It is a lovely folk tale so I just had to share. 🙂 Take care! I love the links! And the art is just beautiful. This looks like a winner. Thanks. Glad you approve, Joanne. It is gorgeous, enjoy! I’ve never heard this version of where babies come from! I like the lyrical excerpt. Nor have I Wendy. It is quite unique and in such a gorgeous book, I just had to share. Have a great weekend. Wendy, I have tried to post on your blog, but it just will not let me 😦 Not sure what I am doing wrong. Folk heritage stories are always so charming and the illustrations look amazing. Yes, I agree, Laura. I too love the illustrations. I love this Kentucky saying/tradition and all the girl’s anticipation in the cover! Glad you like it Joanna. The cover is lovely. Thanks! This sounds like a perfect book for a family with or expecting a new baby. Thanks for the review. Your welcome, Rosi. Nice to see you here. How adorable. I love that she accepts her little brother with love. I wrote a story about the time my youngest brother arrived. Such a lovely cover! Wow! The story must be good. Thanks for sharing! Your welcome rhythm. It is lovely! Those images are just breathtaking. Wow! Your very welcome Kirsten. It is a gorgeous read. Illustrations look interesting, and I always enjoy when a writer puts their own spin on a local saying or myth. Thanks for this Diane. Can we get it at our library? Your welcome, Allie. Nice to see you. Yep, should be able to.